Application domains of our agile feedback response algorithms under limited sensing. The MACS Lab investigates theories and practice of dynamic systems and controls, to seek better understanding and engineering of the systematic interplay between data, system, and control in machines and automation processes that positively impact our lives. 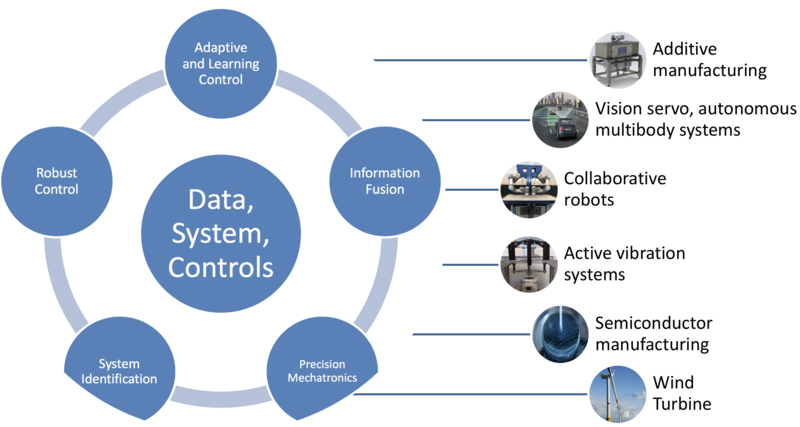 Principle methods include control-oriented system modeling and identification, information fusion, adaptive and learning controls, robust control, precision mechatronics, and optimization. Example projects and applications include new additive manufacturing processes, semiconductor manufacturing, agile robots, nm-scale precision control, vision-based control, human-machine interaction, rehabilitation mechatronics, and vibration rejection. Work from the MACS lab has been supported by the National Science Foundation, UTC Institute of Advanced Systems Engineering, Department of Energy, NASA, and industries. Dr. Chen is a recipient of the National Science Foundation CAREER award and the Young Investigator Award from the ISCIE / ASME International Symposium on Flexible Automation. Members of the MACS lab have received Best Paper Award from the International Symposium on Flexible Automation, Best Vibrations Paper Award and Best Student Paper on Mechatronics Award from the ASME Dynamic Systems and Control Division, Best Senior Design, and best paper in session awards in various conferences.